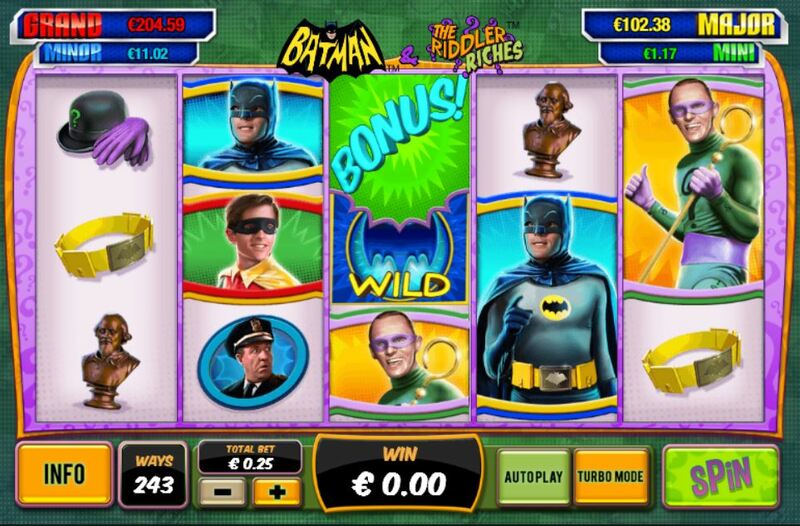 Batman and The Riddler Riches slot is another in the series of DC Comics games available via the Playtech platform. 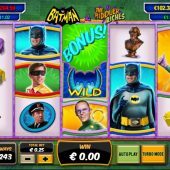 Slightly confusingly, it has been built by Ash Gaming, a subsidiary of Playtech and joins similar releases such as Joker Jewels, Batman and Batgirl Bonanza and Batman & Catwoman Cash. In this one we have 5-reels 3 rows and no pay-lines as it is a 243-way game. The Riddler, Batman and his sidekick Robin are the feature characters. All symbols are single but may appear stacked as they come in as this is a 'cascade' game, in other words the reels drop rather than spin. This results in winning combinations disappearing after paying to be replaced by more symbols until no more wins are formed. Wild symbols in the form of a bat appear on reels 2, 3, 4, and 5 and are non-multiplying. The Riddler is the top-paying symbol at 20x stake for 5-of-a-kind down to the lowest at only 0.8x stake. There is no increasing multiplier for successive cascade wins unlike some games for example Gonzo's Quest. The soundtrack is of course the Batman musical score and wins greeted with Robin's enthusiastic comments to Batman. Randomly the Riddler may turn 4+ symbols into '?' and the reels spin. The '?' will then transform into a similar symbol or Wild which hopefully forms a win with what's spun in. Should 3 Bonus symbols land on the first 3 reels you then get the Riddler's wheel which will stop on one of 3 segments. These are very unlikely to come in on the cascade, as the Bonus symbols disappear along with any wins for some reason! THE RIDDLER BOX BONUS - is a rather tedious pick-me which offers a prize for the first 3 similar values x stake you pick. This can be 10x, 5x, 2x and 1x which is usually what you get. You then pick from a multiplier grid and when 3 similar multipliers are picked that multiplies the win. Yes, it's usually x1 but can be up to 10. THE MULTIPLIER FREE GAMES - successive winning cascades are multiplied 2x, 3x and for 4 or more 5x. You have 10 free falls to try and get a decent run of cascades going. No retriggers is an unfortunate reality in this bonus feautre though. STICKY WILD FREE GAMES - any Wilds landing and involved in a win will stick for up to 3 cascades but are removed before the 4th. win/cascade. 10 chances to accumulate a decent amount and non-retriggerable same as above.